This solar light is proof that functionality does not hav to stand in opposition to attractiveness. 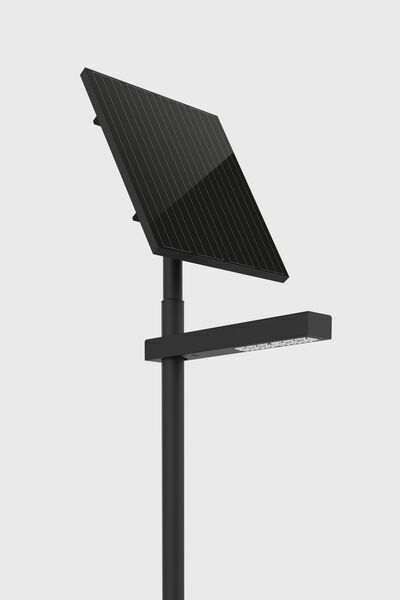 The protos solar lights have a unique appearance in combination with high-quality, robust technology. This solar light is therefore particularly suitable for use in car parks, on cycle paths and on connecting roads in out-of-town areas. 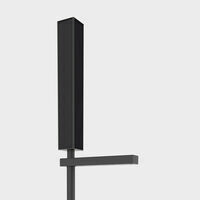 The protos is a cost effective solution regarding acquisition and mounting. 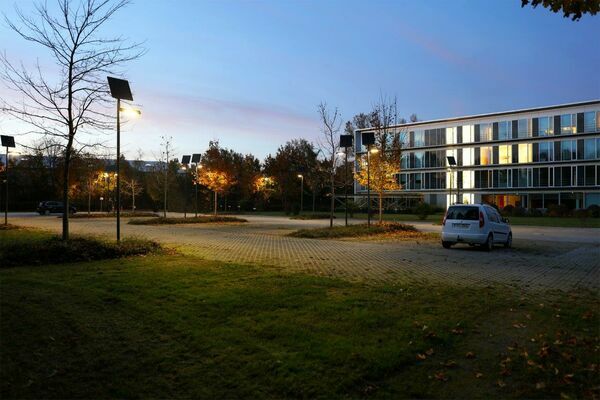 Hereby, the total mounting time, the cost effectiveness, efficiency and superior lighting performance characterise the solar luminaire protos. It is „functional with appealing design“ and it is called protos80. It is a selfsustaining, exterior solar LED lamp with various technical options. The light output of a solar lamp is defined by the incident solar irradiation at the respective location, which is why the quality of the individual components and their optimum interaction play a decisive role. The energy supply is based on an efficient mono-crystalline 80W photovoltaic module, the inclination of which can be adjusted. Protos contains a light module, the LEDs of which demonstrate a very high efficiency (lm/W) and ensure impressive light distribution with their high-quality optics. The LiFePo4 battery used in protos is shored in the ground together with the post so that an optimum, constant temperature is achieved. The long service life of the battery and efficient theft protection are the results. An intelligent controller with independent day- and night-time recognition enables different time programs. It is „functional with appealing design“ and it is called protos150. It is a selfsustaining, exterior solar LED lamp with various technical options. The energy supply is based on an efficient mono-crystalline 150W photovoltaic module, the inclination of which can be adjusted. It is „functional with appealing design“ and it is called protos300. It is a selfsustaining, exterior solar LED lamp with various technical options. The energy supply is based on two efficient mono-crystalline 150W photovoltaic modules, the inclination of which can be adjusted.